It was a common belief Microsoft would never support the premium Outlook Web Access (OWA) experience on web browsers other than Internet Explorer (IE). OWA Premium, as you may already know, is the feature-rich OWA. Non-IE browsers such as FireFox and Safari have been relegated to the “reach” experience of OWA Light, with a reduced feature set. When asked if Microsoft would ever support the OWA Premium experience on other browsers, the common response from the skeptics has forever been: Sure, when pigs fly. If Microsoft licensing ActiveSync to Google (earlier this week..!) 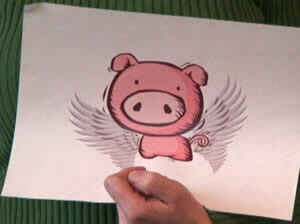 was a precursor of things to come, this year may prove to be the Year-of-the-Flying-Pig! In a video just posted on the Exchange team blog, KC Lemson announces full browser parity in Exchange14, the next version of Exchange Server, and ExchangeLabs— the services offering already running on Exchange14. The video includes a demo of Exchange 14’s support for FireFox, and Safari, in all its premium goodness. This puts all the three popular browsers on par for accessing Exchange14 using Outlook Web Access. ExchangeLabs, the hosted Exchange service (aka "Exchange-in-the-cloud", or the "cloud offering") Microsoft provides for free to students and alumni is now called Outlook Live.  It already hosts 3.5 million mailboxes, and is now available to faculty and staff as well. Also demoed in the video is the new Conversation view of email threads, something that's been on many users' wishlists. The ability to view an entire conversation together, being able to delete it together, and Exchange14’s implementation should make our lives more productive dealing with the ever-increasing volume of email. Wait, that’s not all – Outlook Web Access/Outlook Live also includes integrated instant messaging, bringing email, voicemail, and instant messaging (IM) into a single client. Now you can see presence information integrated within OWA, and start a conversation from within the browser window. It is nice to know my days of suffering for using a different OS while at work or working remotely may come to an end. Nice for them to make an effort to catch up with Google on technology. Probably it was their developers who demanded it though. It is after all so much easier to develop for the Firefox and the rest, and then sort out the IE 6 and 7 inconsistencies. @David: I doubt we've seen the last of the browser inconsistencies and inconveniences. Although, in recent times, the likes of FireFox and Safari have been equally inept or annoying with their CSS/XHMTL implementations. Nevertheless, this is great news for those of us who love Outlook Web Access.